Jean-Jacques-Franois Lebarbier (Le Barbier), French painter, illustrator and writer. He began his studies in Rouen and, at 17, won first prize for drawing at the city s Acadmie. Shortly afterwards he travelled to Paris, entering the Acadmie Royale de Peinture et de Sculpture as a student of Jean-Baptiste-Marie Pierre. In 1767-68 he was in Rome, a fact confirmed by a number of dated and inscribed drawings and paintings, including the pen, ink and wash drawing Landscape Inspired by the Gardens of the Villa d Este at Tivoli (Paris, cole Nationale Suprieure des Beaux-Arts). He was in Switzerland in 1776, where he spent several years drawing illustrations for Bet Zurlauben s Tableau de la Suisse ou voyage pittoresque fait dans les treize cantons du Corps Helvtique (Paris, 1780-86). In 1780, having returned to France, he was approved (agr) by the Acadmie Royale and received (reu) in 1785 with Jupiter Asleep on Mount Ida (Paris, cole Nationale Suprieure des Beaux-Arts). Thereafter he regularly exhibited moralistic pictures at the Salon until 1814, including the Canadians at the Tomb of their Child (Rouen, Muse des Beaux-Arts) and Jeanne Hachette at the Siege of Beauvais (Beauvais, Hôtel de Ville, destroyed 1940) in 1781, Aristoumenos and the Spartan Girls (Paris, Muse du Louvre) in 1787 and pictures of St Louis and St Denis in 1812, both of which indicate his interest in depicting religious themes and incidents from earlier French history. 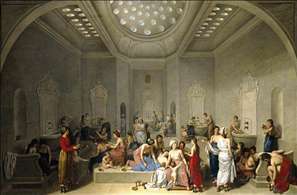 See more details about "A Female Turkish Bath or Hammam"